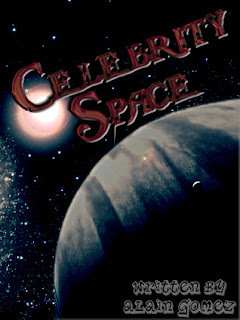 Alain Gomez, Celebrity Space. Amazon Digital Services, 2010. 3,000 words. ASIN B004HD66P4. $0.99. This is a short, nifty little sci-fi piece. While not too demanding, nor heavily esoteric, it is engaging and well written. The story shamelessly taps into both the threatening alien and the shock-ending genres; the latter requiring a build-up and immediate release. In the short story format this works well, reading as a sort of dark, faintly paranoid extended joke with a punch line. It makes for a natural and satisfying finality to this story, while leaving potential narrative threads dangling: a few ‘what next’ hints to titillate and tease, giving the story a cognitive life beyond its final word. Overall, I was very pleased with the experience. Speaking of dangling threads, Gomez seems to be aiming to make a small collection of stories affiliated by the setting, what she calls the ‘Space Hotel Series’ with four so far to the group. Characters cross stories (the doctor figure here features in her own tale elsewhere) as does the setting: a future where the super-rich party on a hotel in space. This story follows the adventure undergone by a shuttle of hotel guests en route to the space station and the somewhat creepy outcome. It’s the final line that’s the real kicker, so I’ll say no more on the plot. You’ll have to try it for yourself! The style is light and casual: fresh and uncluttered. We follow just one character closely. There is a little background on Dan, the company rep, explaining his expertise in crisis situations (he had some time in the navy) and a touch of fallibility (he was booted out for drug misuse) to make him a relatable, feet-of-clay hero without being too cliché. An ironic nod to the necessity sometimes of utilising cliché as a commonly understood descriptive tool for quick scene-sketching is alluded to in the designation of the passengers not by name but by job description: actors, singers, athletes and a doctor. Similarly, the characters conform to the type these titular names bring to mind: shallow, pleasure-seeking public figures and a serious, separate, almost sour scientific professional. Dan is the only name actually used: we are seeing through his eyes alone. Added to this, any sci-fi fan worth their salt will have fun spotting recognisable narrative archetypes: claustrophobic situation, humans in danger in space. But Gomez is using these tricks of the trade, not being used by them. The shortness of the story helps to maintain a high level of brevity and pace, and nothing here has the time to feel hackneyed and dry. One is left with an impression of deft intelligence and wit. Interestingly, despite Dan’s calmness, his clear thinking in the face of adversity (which enables us to track changes in the plot: break down in communications, the loss of visual contact with the space hotel) only go to show that the most competent of us can fail when subsumed by a bigger picture; which itself may not be apparent until it is too late. And also just how tiny mankind is in space, despite the events taking place in a shuttle that seems full to bursting with ego! It’s a humbling consideration, and flavours events with an ‘everyman’ feel in a decidedly sci-fi tale. The events are set in a credible not-too-distant future that is very relatable, and we stick with these characters, worrying and suffering with them. This is a juicy read that fills a few minutes and should find success with the light-reading crowd as well as the sci-fi fan. Even better to this reviewer’s mind; it made me want to follow up and read more of Gomez’s work. This is an oeuvre that seems to specialise in the very short (this one clocks in just over 3000 words) format; bite-sized chunks of entertainment. In the modern attention-span-reduced world, she could well be on to a winner here, and I could see how this tale could be developed into a serial slot in a weekly or monthly publication.